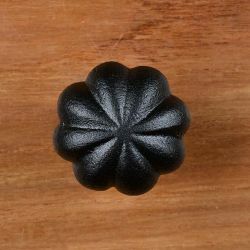 You can easily and affordably change the look of your new or old kitchen or bath cabinet doors, or update a piece of outdated furniture, with this Wrought Iron Round Bevel Cabinet Knobs. 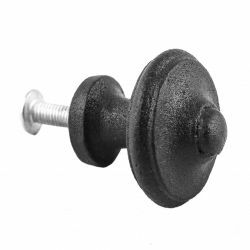 This textured knob has a raised beveled-center design, that will enhance your home's appeal with period-style Country and Colonial detail. 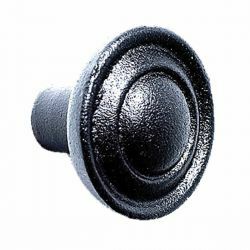 A protective black finish is applied, to protect your cabinet knob for many years against time and wear. Round wrought iron knobs are sold individually, and measures 1 inch in diameter. It has a projection of 1 inch and comes complete with mounting hardware.